The FDNY turns 150 this year, and the NFL Players' Association is celebrating with a special present. 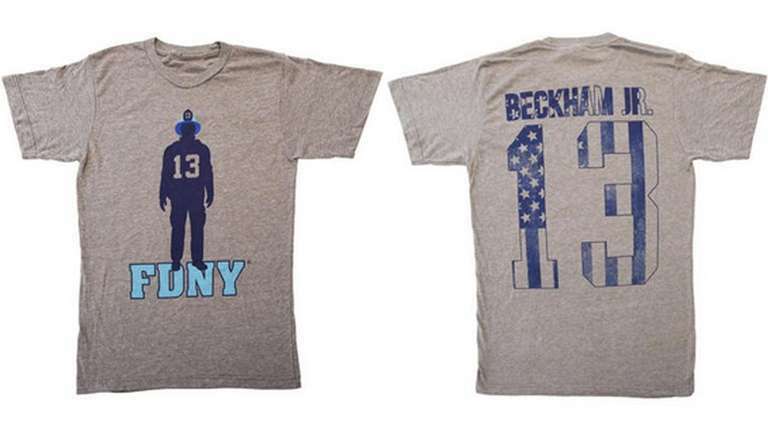 The NFLPA and the FDNY are teaming up to sell limited-edition T-shirts. . The collection coincides with this year's Jets-Giants game Dec. 6 at MetLife Stadium. The shirts will feature official FDNY marks as well as names and numbers of current stars, including the Giants' Odell Beckham Jr. and Eli Manning, and the Jets' Eric Decker and Darrelle Revis. A protion of the proceeds will benefit the FDNY Foundation, which supports public education and training programs. "The FDNY is excited to partner with New York's football stars and the NFL Players Association to continue the yearlong celebration of the Department's 150th anniversary," Fire Commissioner Daniel A. Nigro said in a statement. "This great partnership highlights the brave work of our members and will raise important funds for the FDNY Foundation, helping the FDNY to better protect New York." The shirts are available for a limited time at 25 Modell's locations in the New York and New Jersey area as well as online at modells.com.